If the International Film Festival Rotterdam can be credited for just one thing–and this would leave aside their robust global funding initiatives and industry market–it would be expanding the definition of what fits at a festival. And, therein, the definition of film. For instance, IFFR spotlights everything from installations to initiatives like this year’s Blackout program (curated by Julian Ross), which centered on performances using the now defunct Kodak 35mm carousel slide projector. It follows, then, that the festival’s centerpiece program, the Bright Future section, challenged the narrow idea of film being a title card followed by three acts and credits. At the forefront of this drive, was the winner of the Tiger Award: Zhu Shengze’s Present.Perfect. Zhu’s third feature (after 2014’s Out Of Focus and the 2016 documentary Another Year) falls into the category of found footage: 124 minutes culled from Chinese live-streaming websites where everyday citizens broadcast their lives. Some of these broadcasters, called anchors, rake in millions of viewers and earn money through virtual “tips.” (To frame the mighty scale of this phenomenon, as the IFFR program note states: “The Western circuit of vloggers and YouTubers is dwarfed by live-streaming in China, which in a short time has become an industry worth billions.”) As many populations have become increasingly comfortable with leaking footage of their lives online, this platform might seem mundane. However, it’s worth noting that in China it comes on the heels of live-streaming being rolled out as a form of social monitoring (like, yes, that Black Mirror episode). The onscreen text at the start of the film (the only contextualizing intervention Zhu offers) draws attention to China’s new cybersecurity laws, which gave the government even greater control over internet usage–and also monitoring who is searching what and when. 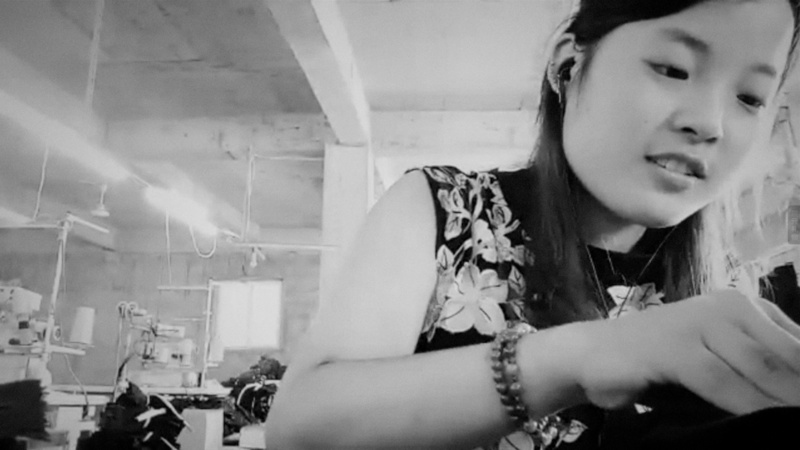 It’s at this intersection of capitalism, exhibitionism-turn-self-surveillance and the digital age that Zhu created her film, culling over and editing down 800 hours of live-streamed footage. Instead of highlighting the stars of this system, her characters are more average in their reach: an off-beat street dancer, a single mother factory worker, a crane operator. While the operations of voyeuristic internet trends favor the sensational, Zhu embeds herself with the mundane and quotidiane (call this the Jeanne Dielman of found footage film). With the streams rendered in sharp black and white, the texture of Present.Perfect takes on a fake-it-so-real quality; some scenes are so strikingly composed that they feel they can’t possibly be organically occuring. But these moments of incredulity are the point: as people become increasingly used to being filmed (or, more sinisterly, no longer question their right not to be) performativity onscreen is also changing. So while Zhu casts a poignant look at Chinese society, she also reframes the internet. Zhu’s work draws attention to points that have become hot topics–the centrality of the internet in our lives, the absolute blurring of online and offline lived experience–but also more nuanced questions about the internet’s ephemerality. “Ephemeral” literally means “to last a day”, but nothing we put out in binary form can really, truly be erased. Indeed, the film itself upsets a founding principle of “live streaming”: that it only is there if you happen to catch it as it’s recorded. While this digital reality is increasingly discussed in terms of rights to privacy, Present.Perfect also raises questions around what directing means in a digital age. Present.Perfect posits not, “How did Zhu get this shot?,” but instead, “How did she find this in the volume of videos that exist online?” It recalls what I wrote about last year from Rotterdam regarding Penny Lane’s The Pain of Others, another found footage experiment based in internet forms of self-documentation. Both Lane and Zhu’s films upset a fundamental core of the online viewing experience: the ability to click away, be it to the next YouTube video or the next stream. Lane and Zhu curate–direct–our experience through internet images in a way that gives them, and therein the internet, new meaning. Duration also plays a role in this: as the average time spent on a video rapidly shrinks along with our digitally-altered attention spans (congrats if you made it this far), Zhu offers a film that clocks in over two hours. If the medium is the message, as Marshall McLuhan’s old adage goes, Zhu seems to be working to alter the supposed facile medium in order to change the message in asking the viewer to really think about what they are watching, why and how is it changing ourselves. I found myself wondering what this means for the concept of the director. If you’re not making the images, are you directing? Or is directing the art of making meaning of images through cut, juxtaposition? In working through this riddle, I realized, more that I thought I would be, how caught I was in an auteur-driven mode of thinking. (It is, afterall, the simplest logical route to take: one author credit, one work of art.) Shaken by my own didactic thinking, I recalled Agnès Varda’s “cinécriture,” the concept that all roles in the filmmaking process have to work together simultaneously to shape the film. In Varda’s case, this meant a radical opening of the filmmaking process that leaned to the collaborative and communal, rather than the centering of one individual. In the age of the internet, her theory can also challenge long-held notions of what precisely directing means. For instance, in The Pain of Others and Present.Perfect, both woman directors also worked as editors. The dramatics, and humor, of both films often fell in the edit, posing the question: can direction be the art of the edit when the images aren’t yours? In both cases, given the profound results that asks viewers to consider their relationships to images, screens and the physical world, I would argue the answer is yes.